Mysore Raspberry, also called Snowpeaks, Ceylon or Hill raspberry is a large shrub sometimes achieving heights in excess of 15 feet. The 2 to 4 inch leaves are dark green above and white or light green on the underside. The long white canes, rachis, petiole and midrib all have sharp curved spines or thorns. The 5-petalled, pink to red purple flowers occurs on axillary and terminal clusters. The fruit turns from red to purple and black when ripe. 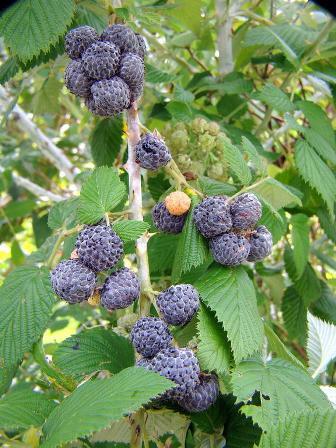 Clusters can contain more than a dozen ripe pleasant black raspberry fruits. One of a few raspberries that will grow at low elevations in the tropics, the fruit is among the over 200 species of edible Rubus found worldwide. The plant spreads by tips of the long canes that bend down to the ground and root. Seed germination is slow and very irregular. In 15 years at a South Kona farm and 10 years at a Honalo farm the plant has not been found outside of the area where it is cultivated. Commercial cultivation has been reported in Florida, India, Puerto Rico as well as Hawaii. In 1823, William Ellis first reported a raspberry, thought to be Rubus hawaiensis Gray, in the volcano area on the Big Island. The Hawaiian Ecosystems at Risk project, (HEAR), reports the Mysore was introduced in 1965. In cultivated orchards no variation is reported as new plantings are made from tip cuttings. 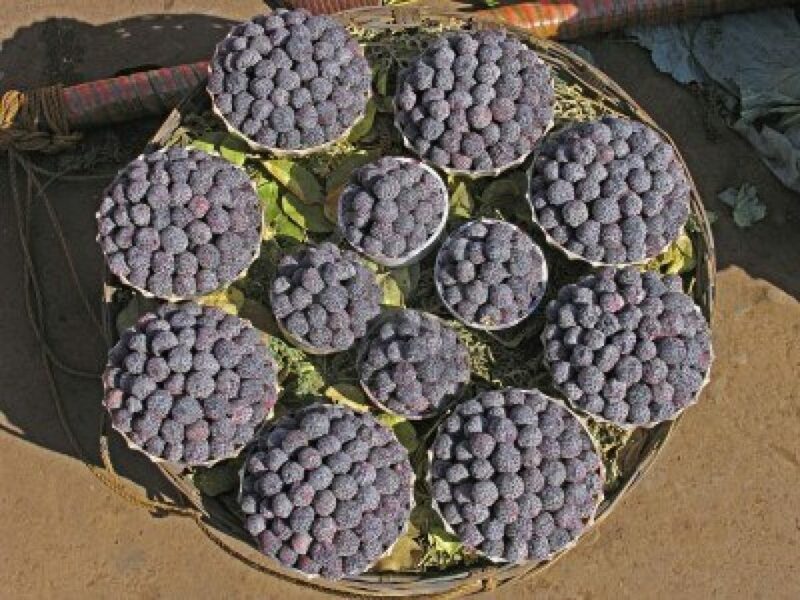 The Mysore berry enjoys an extensive climatic range. It is found as high as the 10,000 foot elevation in its native area to 300 foot elevation in the tropics. The shrub will grow in a wide range of well-drained soils in full sun or semi-shaded areas. Seedlings will produce fruit with the first year of planting. Where cultivated in Hawaii, young tip rooted plants are usually placed 3 to 6 feet apart in rows where a trellis and wire is used to keep the canes upright and facilitate harvesting. Rows are spaced from 7 to 9 feet apart. Commercial raspberries in mainland growing locations average 1200 plants to the acre with trellises. Frequent pruning is employed to keep the canes from growing to excessive lengths and from touching soil where they will root and spread. Harvested branches are removed, as are old canes. This insures fresh growth and production the following year. Although the plant will produce fruit year around, the bulk is harvested, in Hawaii, from February to June. Irrigation is essential in dry areas. Quarterly fertilizing with 6-6-6 and bi-monthly mulching insures steady growth and production. One to 2 ounces of fertilizer should be applied quarterly during the first year followed by 4 to 6 ounce applications in subsequent years. In Florida, 30% to 40% organic nitrogen is applied every 2 to 3 weeks. Due to the invasive nature of the plant, frequent pruning must be emphasized. If left unchecked, the planted area will more than double within a year making harvesting difficult and time consuming. With the sharp curved thorns it is advisable to use leather gloves when pruning and harvesting. 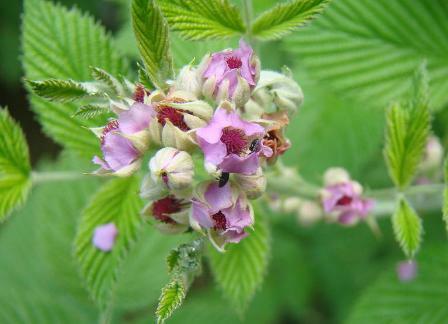 Most members of the Rubus species are susceptible to a variety of pathogens and insects. The Southern green stink bug (Nezara viridula), Red-banded thrips, (Selenothrips rubrocinctus), the broad mite (Polyphagotarsonemus latus) and other mites can cause damage to young leaves and are occasionally found on the undersides of leaves, usually those low to the ground. Aphids spread raspberry leaf curl. Regular applications of organic soaps or organic pesticides on non-fruiting canes will control most of the pests. Minimal damage from insects and birds on the fruit has been reported. No fruit fly infestation has been reported. Seed germination is slow and very irregular. Plants can be propagated by stem cuttings but the preferred method is tip rooting. Pots with peat moss and soil are placed about a mature shrub with tips from long canes buried 4 or 5 inches in the soil. The potted plants are ready for field planting in 4 to 5 weeks, after new growth appears and the parent cane cut. Berries picked for market should be 3/4 purple-black. Fully ripe purple berries have a shorter shelf and harvested for culinary use or frozen for future use. Mysore raspberries should be harvested daily during peak periods and in excessively hot or wet weather, at least twice weekly during other times. Berries are picked and placed directly in the marketing container (vented clamshell), generally on top of absorbent pad or section of napkin that lines the bottom of the container. No more than 2 layers of berries to a container will prevent damaged fruit. To maximize their shelf life, berries should be cooled no more than a half hour after picking. Damaged or culled berries can be placed directly into freezer bags and frozen for culinary use. In Florida, plants that received afternoon shade had a higher yield than those in full sun, with eight test plants producing 50 pounds of marketable fruit. A single shrub in South Kona produced 4000 fruit weighing 14.5 pounds in a 1year period. 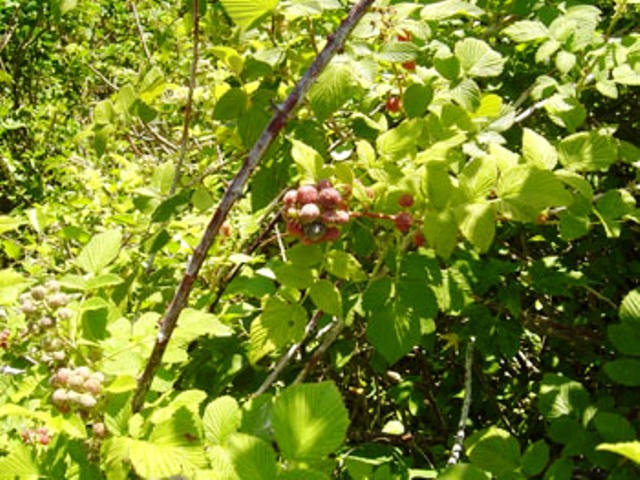 Loss of marketable fruit can be as high as 30% in some raspberry growing areas do to poor handling during the harvest and improper postharvest care. Raspberries should be stored at 31 to 32˚F with a relative humidity of 90%. Improper chilling or display in retail outlets can cause gray mold (Botrytis cinerea Pers). The project Mysore raspberry plant produced an annual marketable yield of 11.6 pounds. The average market price was $7.00 per pound, and therefore the plant generated a gross revenue of $81.20 for the year. Growing costs (fertilization, irrigation, pruning and all weed and pest control) amounted to $48.37, and harvesting costs (picking, packing and delivery to market) totaled $80.61. (All labor to grow and harvest the Mysore raspberries was assumed to be paid at an hourly wage rate of $16.00, including withholding, FICA and benefits.) Thus, the total annual operating costs, sometimes referred to as “variable costs,” were $128.98. The gross margin (gross revenue minus all operating costs) was a negative $47.78. The Mysore raspberry gross margin is the amount of money available to pay all the ownership costs associated with the Mysore raspberry enterprise. Ownership costs, sometimes referred to as “fixed costs,” include the value of land used (rent or rent equivalent or mortgage and property taxes), the value of the capital investment (such as the tree establishment cost and buildings and vehicles), the value of the management, and the value of any unpaid labor. (All paid labor is already included in the gross margin.) Ownership costs, unlike operating costs, will vary substantially from farm to farm and will depend largely on how the farming operation is financed and on economies of scale. Each grower will have to calculate his total farm ownership costs and then allocate an appropriate portion of these costs to each enterprise on the farm. Now the profitability of the Mysore raspberry enterprise can be determined by subtracting the Mysore raspberry enterprise’s share of the total ownership costs from the gross margin for Mysore raspberries. The Mysore berry has been in great demand by hotel chefs on the Big Island in 2005, even with the readily available mainland berries. Chefs have expressed a desire for locally produced fresh berries for use as both a decorative topping on desserts and for producing sauces or glazes. Packaging a single layer of the fruit can be time consuming but will insure it’s stability for decorative purposes. Culled fruit can be placed directly into freezer bags and frozen for future sales. As the time from harvest to chill is crucial for the longevity of the berry, it’s advisable to have a cooler in the field so that each filled 2oz clamshell container can be kept cool and out of direct sunlight. Fresh and frozen berries were sold directly to hotel and restaurant chefs for $7.00 per pound. Health Benefits – High in manganese, the berries supply more than 60% of the recommended daily allowance. Manganese helps the body with calcium absorption and aids in the prevention of osteoporosis. It is also a good source of dietary fiber.